The sea itself poses certain dangers. In general terms, inshore waters can be more treacherous than the deep sea. Being close to land brings problems such as submerged hazards: rocks, trenches, shelves, reefs and so on. These can hole a boat or entangle the nets. A large body of water moving in a confined space between rocks or headlands produces stronger currents than those found in the open sea. The waters swirl about these obstacles causing localised eddies, particularly around headlands. These can pull a boat in and dash it against the cliffs, or throw it up onto the beach. Tides too, are powerful forces. They can sweep a boat out to sea if, for example engine power is lost. The mixing of waters at the mouth of a river or stream can also cause unexpected currents to trap the unwary. Most loss of life in the great fishing disasters occurred when the fishermen tried to get back to land. The wind magnifies the effects of these currents and makes the boats more uncontrollable. It becomes extremely difficult for the men to avoid the obstacles lying between them and safety. Such obstacles are, of course, themselves a danger. Rocks can be barely submerged or only covered at high tide and these can easily pose a hazard. Vessels might either run aground or be holed and sunk. 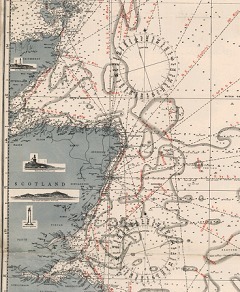 The first sea chart was produced for the North Sea in 1847. Before this, fishermen had only their own knowledge and experience to guide them.